MINNEAPOLIS & REHOVOT, Israel & TEMPE, Ariz.--(BUSINESS WIRE)--Apr. 17, 2018-- Stratasys Ltd. (NASDAQ: SSYS), a global leader in applied additive technology solutions, and Phoenix Analysis & Design Technologies, Inc. (PADT) jointly announced the companies are teaming with Lockheed Martin Space to deliver next-generation 3D printed parts for NASA’s Orion deep-space spacecraft. Key to the project are Stratasys advanced materials – including an ESD variant of the new Antero™ 800NA, a PEKK-based thermoplastic offering high performance mechanical, chemical, and thermal properties. Orion is NASA’s spacecraft that will send astronauts to the Moon and beyond. Orion’s next test flight, dubbed Exploration Mission-1 (EM-1), will be the first integration mission with the world’s most powerful rocket, the Space Launch System, where an un-crewed Orion will fly thousands of miles beyond the Moon during an approximately three week mission. The following flight, EM-2, will also go near the Moon, but with astronauts on board, a first since 1972 and will enable NASA to prepare for increasingly complex missions in deep space. The mission will use more than 100 3D printed production parts on board, engineered in conjunction with Lockheed Martin, Stratasys and PADT. The production-grade, thermoplastic 3D printed parts for NASA’s Orion vehicle are produced at the Additive Manufacturing Lab at Lockheed Martin in conjunction with PADT, which now employs the latest in Stratasys 3D printers and materials. Using advanced materials such as ULTEM 9085™ resin and the new Antero material incorporating critical electro-static dissipative (ESD) functionality – NASA could meet key requirements for 3D printed parts to perform in the extremes of deep space. Antero is ideally suited to meet NASA’s requirements for heat and chemical resistance, along with the ability to withstand high mechanical loads. The Lockheed Martin, Stratasys and PADT-engineered collaboration is differentiated by an ability to create consistency and repeatability in mass scale across the entire additive manufacturing part production process. 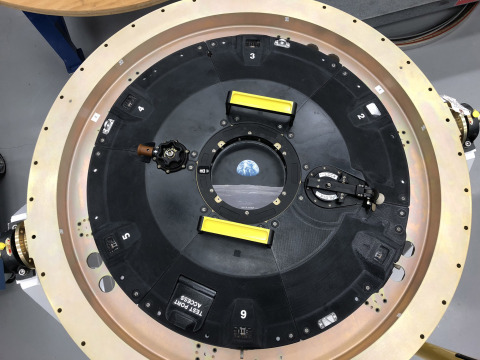 Lockheed Martin is also one of the first customers leveraging Stratasys’ Antero, using the new thermoplastic for a critical part situated just outside of Orion’s docking hatch. The complex part consists of six individual 3D printed components locked together to form a ring on the craft’s exterior. The part is currently on display in the Lockheed Martin booth #603 at the 34th Space Symposium in Colorado Springs, COApril 16-19. PADT is currently joining Stratasys in their booth #537 at this week’s 34th Space Symposium. For further detail on how Stratasys is transforming aerospace and space exploration through 3D printing please visit: http://www.stratasys.com/aerospace. Stratasys is a global leader in applied additive technology solutions for industries including Aerospace, Automotive, Healthcare, Consumer Products and Education. For nearly 30 years, a deep and ongoing focus on customers’ business requirements has fueled purposeful innovations — 1,200 granted and pending additive technology patents to date — that create new value across product lifecycle processes, from design prototypes to manufacturing tools and final production parts. The Stratasys 3D printing ecosystem of solutions and expertise — advanced materials; software with voxel level control; precise, repeatable and reliable FDM and PolyJet 3D printers; application-based expert services; on-demand parts and industry-defining partnerships — works to ensure seamless integration into each customer’s evolving workflow. Fulfilling the real-world potential of additive, Stratasys delivers breakthrough industry-specific applications that accelerate business processes, optimize value chains and drive business performance improvements for thousands of future-ready leaders. Corporate headquarters: Minneapolis, Minnesota and Rehovot, Israel. Online at: www.stratasys.com, http://blog.stratasys.com and LinkedIn. Phoenix Analysis and Design Technologies (PADT) is an engineering product and services company that focuses on helping customers who develop physical products by providing Numerical Simulation, Product Development, and 3D printing solutions. PADT’s worldwide reputation for technical excellence and experienced staff is based on its proven record of building long-term win-win partnerships with vendors and customers. Since its establishment in 1994, companies have relied on PADT because “We Make Innovation Work”. With over 80 employees, PADT services customers from its headquarters in Tempe, Arizona, and from offices in Torrance, California, Littleton, Colorado, Albuquerque, New Mexico, Austin, Texas, and Murray, Utah. More information on PADT can be found at www.padtinc.com. Lockheed Martin,headquartered in Bethesda, Maryland, is a global security and aerospace company that employs approximately 97,000 people worldwide and is principally engaged in the research, design, development, manufacture, integration, and sustainment of advanced technology systems, products and services. Stratasys is a registered trademark and Antero and the Stratasys signet are trademarks of Stratasys Ltd and or its subsidiaries or affiliates. ULTEM is a registered trademark of SABIC or its subsidiaries or affiliates.